Tickets:$34-$79 (subject to change). Visit www.SJRep.com or call 408-367-7255. 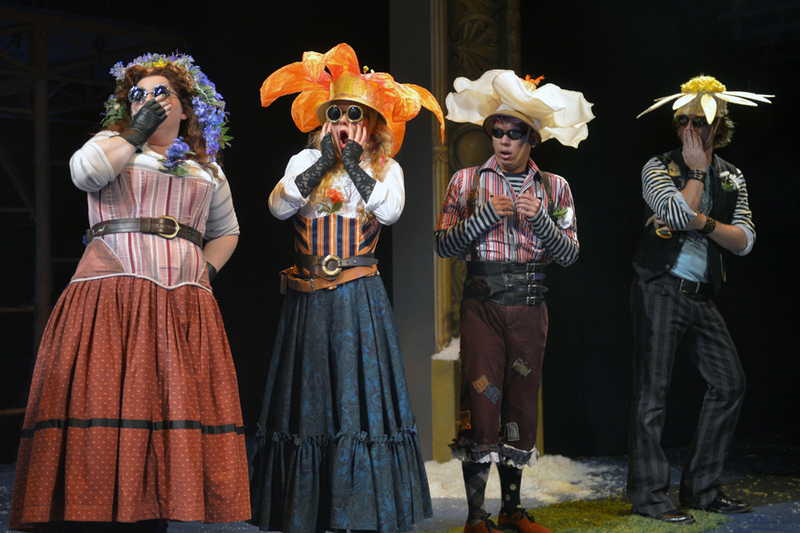 Summer Latimer, Janice Engelgau, Jomar Martinez and Jason Hite, from left, as flowers in San Jose Rep's world premiere musical adaptation of Hans Christian Andersen's "The Snow Queen." The show runs November 27 through December 22, 2013. 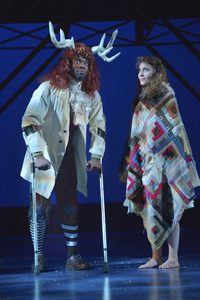 "The Snow Queen" at San Jose Rep could use a little work, but it's enough of a delight that it is easy to recommend it. Musicals don't spring on stage fully formed and perfect in their first outings, and this world premiere production could use a little trimming, and some of the cast could use a little tweaking, but overall it is an exciting and fun show that left a thrilled audience of adults and children in its wake at San Jose Rep on Saturday afternoon. The show, with book by Kirsten Brandt and Rep Producing Artistic Director Rick Lombardo, and music by Haddon Kime, and lyrics by Brandt, Kime and Lombardo, is based on the story by Hans Christian Andersen. Kind of loosely based, as far as I can tell, because in the original, faith in God and prayer and angels are key factors in what happens. This telling of the story kind of leaves those parts out, but keeps the essentials: It's still about evil forces against children, and how the pure heart and bravery of the little girl saves the life of the little boy. And this version kind of takes a turn that modern, tech-oriented kids will understand, as the lost boy, under the spell of the evil troll and the Snow Queen herself, attempts to use math to solve a puzzle, all the while pantomiming the movements that might be made on a huge computer monitor. Or in vertically forming pieces of ice into a word, as happens in the original. Tim Homsley as Kai, front, is under the spell of Jane Pfitsch as the Snow Queen. Tim Homsley is a fine Kai, the boy who has shards from an evil troll's mirror in his eye and heart that keep him from seeing that the girl next door, Gerda, is his BFF. Kai willingly runs off with the Snow Queen. He wants more kisses from her, kind of ignoring her warning that too many kisses will kill him. Eryn Murman, who was excellent as Wendla in SJ Rep's 2011 production of "Spring Awakening," is excellent here, too, as Gerda, who runs off to save Kai. She loses her shoes to the river, and spends most of the rest of the show trudging over the frozen tundra (and metal stairs of the stage constructions) on bare feet. She has many adventures, including being captured and bewitched by a witch, being briefly saved by a prince and princess, and being waylaid by a family of robbers. Everybody in this show has good pipes -- the singing and music are mostly fabulous  but Jane Pfitsch, as the Snow Queen, was amazing, nailing some very impressive coloratura lines. She also played violin beautifully. Jason Hite, another veteran of that 2011 "Spring Awakening," played several parts  and guitar  but was brilliant and hilarious as the old crow, who helps Gerda on a part of her journey. His wings, presumably by costume designer Frances Nelson McSherry, were just bits of pretty mesh over sticks. But the way he walked, squawked and jerked around were pure crow  as was his delight in eating a huge worm (Gummy Bear worm, it looked like). 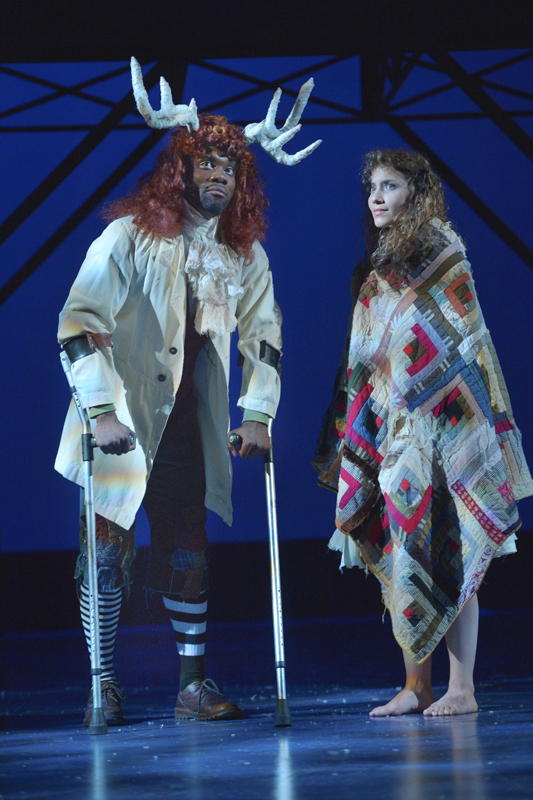 Rhett George as the Reindeer, left, and Eryn Murman as Gerda. Rhett George turned in a number of fine parts as well, but one of the most clever was as a reindeer. It was more than the antlers on his head and the cuffed forearm crutches that became his forelegs  it was the way he walked, in that tenative, careful way of deer everywhere. For a while, he carries Gerda on his back. She looks so small and vulnerable. There is a three-piece core band  Dolores Duran-Cefalu on keys, Andrew Currier on electric and acoustic basses, and Michael Barsimanto on percussion  but several members of the cast at various times play acoustic and electric guitars, mandolin, chimes, violin and keys. It's fun, and it's a talented bunch. One of the guitar players looked a little uncomfortable as an actor, but his guitar playing was excellent. The music was mostly a fine mix of Broadway-ish tunes and rock, and the sound design by Steve Schoenbeck, and stage mixing by ... somebody ... was excellent. Electric instruments and some hard-rocking tunes among the ballads, and the rock sound was never really overwhelming. Most of the time it was Goldilocks  just right. Forget anything looking like scenic Denmark from old Christmas cards; designer Erik Flatmo gives us something that looks like a wonderful Erector-set factory dream, with moving staircases and a wide widow's walk kind of parapet from which rules the Snow Queen, high above the stage. There is a projection screen backdrop that is only modestly employed. The costumes, by McSherry, are colorful fun, especially for the five members of the cast who are flowers for a while. Pfitsch was dressed in a fabulous white dress with cleavage that was mostly wasted, since she spends most of the show too high up on Flatmo's set for the cleavage to be apparent. She also had a clever, beautiful crown. The cast, overall, was excellent, managing the transitions from cute and goofy (flowers) to seriously scary (robbers, troll, killer snowflakes) with considerable fun. Trim a dull tune here or there, clarify the narrative a bit, and this could be a fine perennial for San Jose Rep and elsewhere. 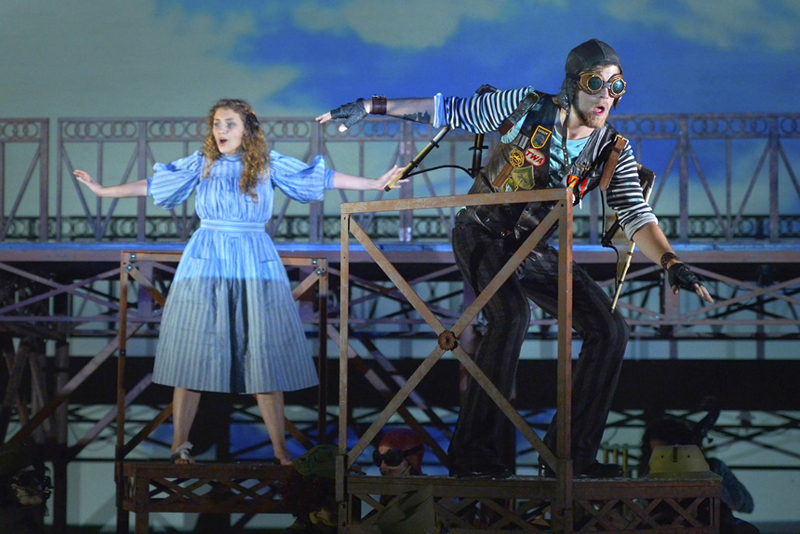 Eryn Murman as Gerda, left, flies with Jason Hite as the Crow in San Jose Rep's world premiere musical adaptation of Hans Christian Andersen's "The Snow Queen." The show runs November 27 through December 22, 2013.